This is a new feature here at From the Front Row, in which we take a look at a film that was released 100 years ago, examining what was going on in the world of cinema exactly a century ago. This year we will periodically be exploring the films of 1919, starting with Irving Willat's shockingly savage Behind the Door. "I told him...that if I ever caught him I'd skin him alive; but he died before I finished... Damn him!" 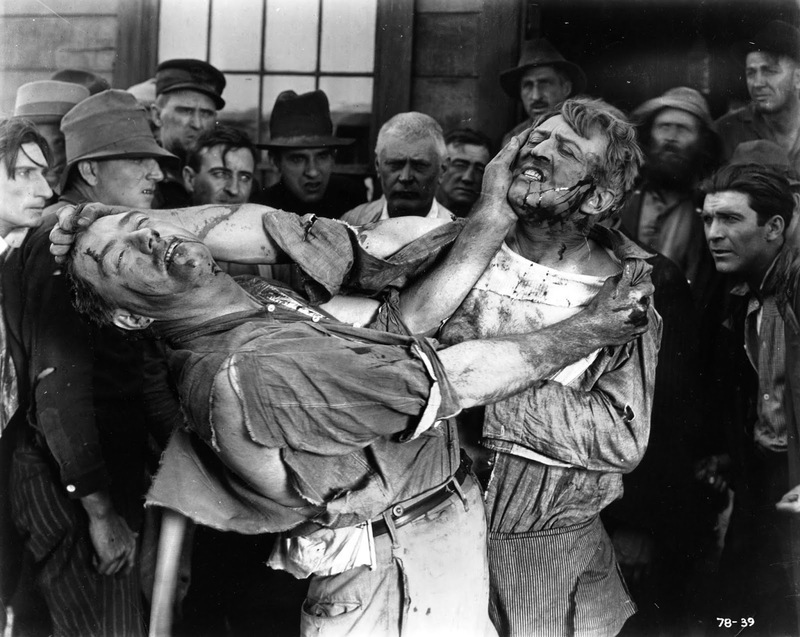 There are few films from the silent era as startling or as darkly gruesome as Irving Willat's Behind the Door, a WWI revenge thriller released only one year after the Great War ended. The film follows Oscar Krug (the extraordinary Hobart Bosworth), an American taxidermist who has the misfortune of having German heritage just as the USA declares war on Germany. Attacked by the neighbors he once called friends, Oscar volunteers for the military, and is made captain of a ship. Distraught, his wife stows away on the ship in order to stay with him during the war. When his ship is torpedoed by a U-Boat, the two are cast adrift in a lifeboat, only to be rescued by an enemy vessel. 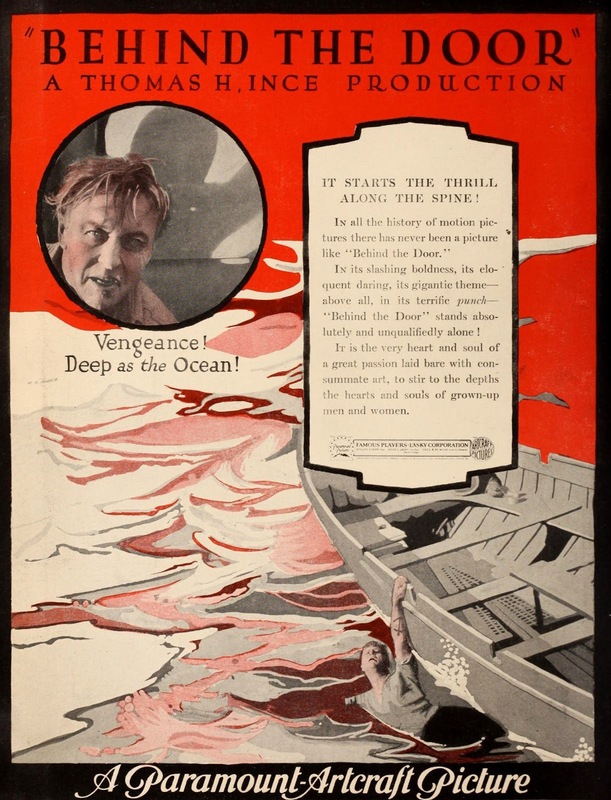 Rather than save them both, the U-Boat captain takes Oscar's wife, and casts him back out to sea to drown, sending Oscar on a bloody quest for revenge. Despite the fact that some of the film remains lost, Behind the Door is a harrowing experience. It may tame by today's standards, but it's hard to deny the visceral impact of its horrific climax. Willat pulls no punches when it comes to the horror that awaits the U-Boat captain at Oscar's vengeful hands. The film was something of a sensation at the time, quickly gaining an infamous reputation for its grim subject matter. Yet there is a tenderness underneath its bloody exterior. At its heart, Behind the Door is a love story, one that continues just as strongly after death. Willat stages action sequences with a true master's eye - the scene in which the townspeople attempt to kill Oscar for his German heritage is especially thrilling, illustrating the depth of the suspicion and bigotry that was directed at those of German descent (some things, it seems, never chance). The restoration on the new Flicker Alley Blu-Ray is simply stunning, utilizing illustrated placeholders to take the place of the missing scenes, helping the story continue almost seamlessly. Behind the Door is a forgotten treasure, a haunting tale of love and vengeance that stands as one of the most gruesome and disturbing films of the silent era. Behind the Door is available on Blu-Ray and DVD from Flicker Alley.